A somewhat different viewpoint on the development of drought considers how much precipitation has fallen (or not) and how much is likely to fall in coming months, based on climatology. The following are maps of this and previous years’ drought development that explicitly takes both of these aspects into account. Below uses the same methodology above, but is calculated for various fractions (including 100%) of water year total precipitation. 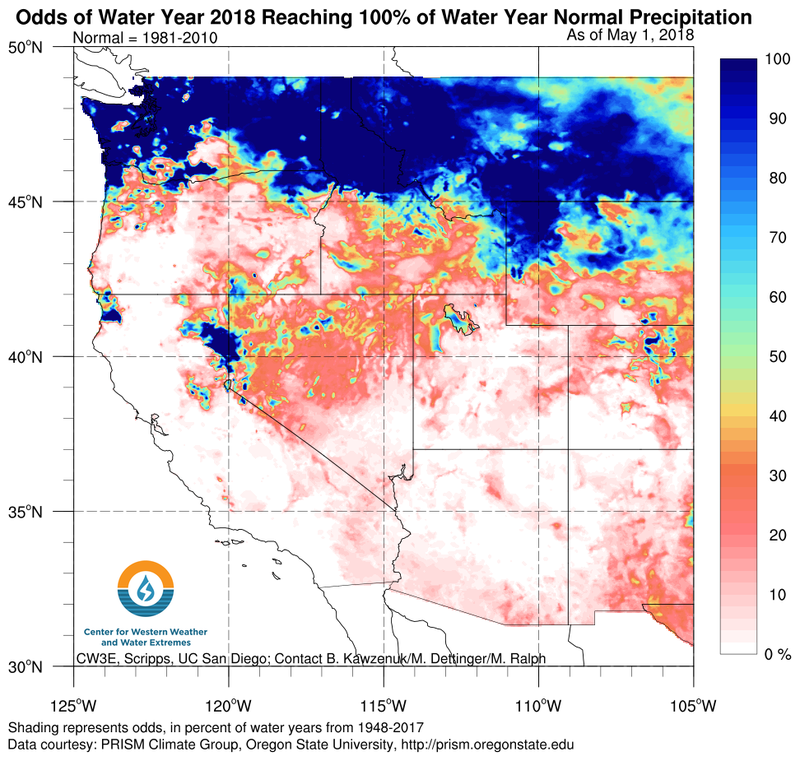 Below flips the analysis and shows what water year total precipitation percentage has a 50% (and other exceedances) chance of being equaled or exceeded this year. The above methodology can be applied to time periods beyond the current water year. Below shows the probability of reaching 100% (and other exceedances) of normal two year precipitation by the end of the next water year. At the end of a given month, if we know how much precipitation has fallen to date (in the water year), the amount of precipitation that will be required to close out the water year (on Sept 30) with a water-year total equal to the long-term normal is just that normal amount minus the amount received to date. Thus the odds of reaching normal by the end of the water year are just the odds of precipitation during the remaining of the year equaling or exceeding that remaining amount. To arrive at the probabilities shown, the precipitation totals for the remaining months of the water year were tabulated in the long-term historical record (WY1948-2017 in these figures) and the number of years in which that precipitation total equaled or exceeded the amount still needed to reach normal were counted. The fraction of years that at least reached that threshold is the probability estimate. The calculation was also made for the probabilities of reaching 75% of normal by end of water year, 125%, etc., for these figures. Products on this page are considered experimental.